If you’ve read this blog, you’ll see that I’m not a huge fan of ST rolls. I prefer using comparative ST (or even Basic Lift) to calculate a modifier, and then rolling against . . . something . . . with that modifier applied. In fact, that’s what Control Points (from Technical Grappling) basically are: a proxy for the power of your grip or applied force (damage analog) that either apply a penalty directly (often at -1 per 2 points) or can be spent to apply penalties 1:1, which makes them similar to thrust damage in progression and power. 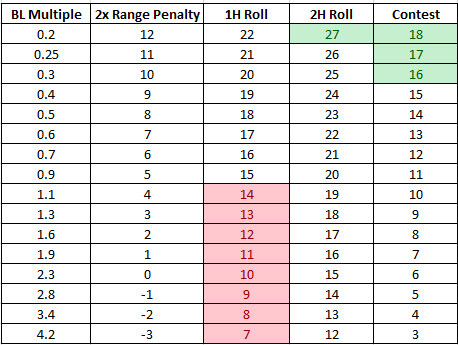 But saying, “Oh, just roll against Skill with ST as a modifier” does have a drawback, in that it might privilege DX and the cheaper skill even more than usual – and if you can pit skill (at 4 points per level) vs. ST (at 10 for “full” ST, though only 3 for Lifting ST) mostly you’ll win by picking skill. And yet, one of the reasons that Control Points and the Training Bonus were priced the way they were in TG was to keep ST cheaper – especially for multiple skills – as a way to make your grappling life better. All things being equal, the stronger fighter will win. Of the single rapier fight between valiant men, having both skill, he that is the best wrestler, or if neither of them can wrestle, the strongest man most commonly kills the other, or leaves him at his mercy. OK, so blah, blah – it’s good to be strong. But I hate ST rolls, because I think rolling against an extrinsic quantity is dumb. If you have a ST 15 man trying to lift a rock, he’s either got the ST to do it, or he doesn’t. Rolling ST to see if you can apply ST doesn’t work well – it’s basically recursive. What about penalized ST? Meh. Still rolling against a quantity not normed to a 3d6 roll. It’s possible to adjudicate this with a ST roll, but you’re going to have to be lavish with penalties. First, if we look at the rules for lifting things, found on p. B353, you can see that simply by taking Ready maneuvers, you can pick up (in two seconds) one handed a mass equal to twice your basic lift. In two hands, but taking four seconds, you can hoist up 8xBL. Well, if the first lift takes two seconds on the average, then you’re rolling against a 10. If the second lift takes 4 seconds, you might be rolling against an 8. Can we rationalize this? Well, it has to scale, so that a ST 40 creature and a ST 10 creature both exerting themselves at 2xBL have the same odds of success. So a ST 10 creature needs to be operating at no penalty, while ST 40 needs to be operating at -30. So that means that lifting penalties must also be extrinsic. That is, the penalty for lifting a 500-lb boulder is independent of anything else. That’s actually darn handy. So in order to normalize all ST rolls properly, you convert whatever weight is being lifted into an equivalent ST using the usual Basic Lift formula (ST = sqrt (5xWeight)), multiply it by 0.7 (call it 0.7), and subtract that from 10. OK, now that’s for a 1-handed lift. The two-handed lift works out to a skill of 8, but much higher lift multiple. Do we wind up with a different scaling? I’m sure we do. Will it be easy to parse out? Let’s see. Yep, the trend is different, but you can relate to it. OK, so the first number is the skill roll required, while the divisor for the sqrt(2) term incorporates the number of hands (2 instead of 1). The 8xBL vs 2xBL comes into play with the ST-equivalent calculation. There are some clear issues with what’s going on up there, though. For one, the faster you do the lift, the lower your penalty. This is an artifact of the starting conditions: the light, one-handed lift happens in two seconds, while the heavy, two-handed one takes four. But the target number can be seen in the table to the right. The faster you lift, the higher your target, and so perversely you have a higher chance of a burst lift than you do a slow-and steady one. ST-equivalent: sqrt(5×160) = 28.28, and multiplying by 0.707 gets about 20. Dividing that by two for two hands is 10. Two-second lift: That’s just a target of 10. So you’re at -10 to do this lift 1-handed, and no penalty to do it with two hands. (10-20 vs 10-10, for -10 and 0 with one and two hands). From there on, just roll vs. ST with that penalty. Success means you lift the weight. And failure . . . The problem with the fast lift is that you’re risking an injury or out-of-control condition. So if the penalties for lifting faster are lower, because you’re expecting fewer fails before you succeed, then we’ll need something to counterbalance that. Something where the faster you go, the more likely you may get hurt. Let’s look at our two lifts above, 160 lbs with one and two hands. The penalties for a 1, 2, and 4 second lift (implying target numbers of 16, 10, and 8) would be -4, -10, and -12 for one-hand, and +6, 0, and -2 with two. Yeah, so we definitely have issues if we just use this to roll vs. ST. We need a “did you hurt yourself” check first, and only then a “did you complete the lift” check. ST: What it says on the tin. Your ST score. Oh, and by-the way: I don’t think a 4-armed creature gets 4 there. It’s either 1 for one hand, or 2 for two-or-more. So an average guy (ST 10) trying to lift 40 lbs (ST equiv of 14.14, penalty of -10 in one hand) in two seconds (target 10) will have a ST roll of 10 to lift it, but an injury penalty of 10-10-10 = -10. That’s a hefty penalty, and honestly a HT 10 guy shouldn’t be worried about injuring himself here, because right now, he can lift that same 40-lb weight with two Ready maneuvers and no risk of injury. That suggests a net roll of 14 to 16, Or a bonus of something like 15 to the quantity above. So let’s try that for a ST 20 guy, who should be able to lift 160 lbs in one hand with that same ease. Injury Modifier: 15 (constant) + 20 (ST) -16 (Target) – 20 (lifting difficulty) = 35-36 = -1. So to do it in two seconds a prospective HT check would be at HT+5; in one second with little risk of failure you’d roll at HT-1. That doesn’t seem like crazy talk. It does seem like way too much calculation to pick up a rock. It also makes me say Eww. At least two rolls – maybe three – per turn in order to lift something. Well, these are the trials and tribulations of wanting to keep rolling vs. an extrinsic parameter. So, what happens if someone with ST 10 wants to lift 220 lbs in two hands, taking a target number of 7? Injury Modifier: 15+10-7-12: 25-19 = +6. So taking one’s time will eliminate the possibility of injury (roll at HT+6), but you’ll roll at ST-5 to make the lift . . . 22 seconds to move BLx11. Let’s say that a failure by 10 means you risk injury or lose control of the weight. So you make a DX check, and if you make it you can drop it safely. If you fail, you make a HT check or take damage. Well. This kinds stinks, really. To make an extrinsic roll make sense (Roll vs. ST to lift the weight), then other weights need to be put in the same terms. That’s not bad. Each weight can be simply converted to a Weight Modifier for a one-handed lift. Halve that penalty for a two-or-more handed lift. Roll HT to see if you hurt yourself just applying the initial force. If you don’t hurt yourself, start making ST rolls. If you make the roll, you complete the lift. If you fail the roll, but not by 10+, you’ve not hurt yourself but you didn’t complete the lift. If you fail by 10+, you botch the lift. Proceed to 4. Botched lift: Make a DX check. If you make it, you abort the lift successfully. If you fail . . .
Make a HT check. Fail it and you injure yourself. Up to three rolls just to lift something? Even if you push the boundaries of target number, ST equivalents, injury and whatnot, you’re still doing way too much work here. The concept of a Weight Penalty makes sense. It’s the ST-based equivalent of a multiple of Basic Lift. But what you really want to do here is to take a “multiples of basic lift” approach for the entire thing, and calculate a penalty. Then, you want to roll against something. 1xBL should be pretty much instant success with one hand – say +4 to +6. 2xBL should roll against a 10. 8xBL with two hands rolls against an 8. Red means you can’t even roll to lift it. But maybe you add 5 to it if your goal is to “shift slightly.” So that you need a crit with two hands to shift 50xBL slightly (you’ll be trying it for 30s or so), but with one hand, you can shift about 15xBL a bit. So that’s at least “make one roll, and on a failure, maybe you need to check to see if you drop it or injure yourself or something.” It scales automatically, since it’s based on an NxBL figure. And it uses a table that every GURPS player has. What about ST vs ST? This is also force on force, and the best way to look at it is probably a ratio of BL to BL. That provides a good assumption that whatever the right ratio of effort is (I can fight at 6xBL! ), it’s common to all. So ST 10 vs ST 20 has the ST 10 guy resisting 4x his own BL, while the ST 20 guy is pushing back against only 0.25xBL to achieve “balanced” levels of force. If we use the same scale as pushing vs a static object, then only one party should roll. If I try and split it into two rolls (so each party gets their own lookup), that is perhaps more satisfying, but it creates some artifacts. So I’m just going to have the PC roll vs a look-up table result. The GM can either assume that he’s rolled a 10 vs. a 10 target (and leave it all in the hands of the PC) or actually roll if more variability is desired. You could easily turn this into a ST vs ST table (I did that too). But basically, take the foe’s ST divided by the PC’s ST and square it. Look that up as the BL multiple on the SSR table, double the modifier, add that to 6, and roll. If you make the roll, you win. Fail it, you lose. If the GM also wants to roll, it’s whoever makes it by most, or fails by the least. The only other possibilities for contests of power (or at least those that are strongly influenced by power) are DX and HT. DX makes sense in some cases – such as combat skills, which take account of relative ST through a damage roll (or a control point roll, in Technical Grappling). HT seems good at first – hey, if you’re robust, you can push your limited ST farther without buckling. That’s all well and good, but HT is more frequently fatigue and exhaustion rather than structural power, and doing it that way means a ST 10, HT 20 guy has a super-duper advantage arm wrestling a ST 10, HT 10 guy. That’s probably not desirable. So I think the flat values explored above are the right mathematical way to go if you’re replacing ST rolls with ST-modified target rolls. – it's got to be simple. – it's got to be a roll, because we don't just say "DX 14? You just make it." 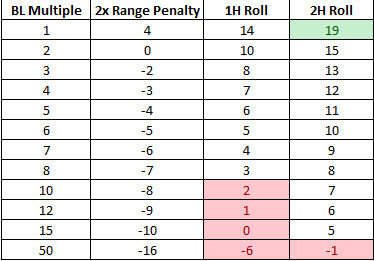 This is why I still have rolls vs. ST, and why I'll cheerfully normalize around ST 10 like in a Regular Contest of ST. Is it perfect? Not really. Can it be recursive? Yes, but so can any roll (I roll against DX to see how agile I am!). Is it simpler to use a stat on the sheet and not look stuff up? Yes. Done and Done. This is why everyone knows that you can jump over at hex at cost 2, but has to look up their Broad Jump. One you look at, one you look up. I'd be fine with a replacement, but it's got to be vastly better if it's going to be even a little more complex and/or slower to use in play. TG has the beauty of swapping a single system that's simple and binary with a single system that is simple and not-binary. That's the standard I like – does this make my life easier and give better results? Perfect! One of those two? Okay. Makes things more complex and/or gives worse results? No. This can be an impossible task with ST, being that it wasn't designed ground-up to do all the things it could do.